I have a dishwasher but I wash cutlery, utensils and pots and pans by hand. Sometimes I wash a few other items in the sink too and that is what I was doing a few minutes ago as I took a break from writing. There I was, wearing rubber gloves, the sink full of hot bubbly water when I was bombarded by great writing ideas. And I couldn't write them down. Why did I get creative when doing the dishes? Perhaps because I was relaxed and not concentrating on one topic for an article my brain was free to generate lots of ideas instead of being restricted. Perhaps because I didn't need to concentrate on every step of the job my mind could wander. There is research evidence that one is more creative when daydreaming than when under pressure. I find washing up can be quite relaxing because it is a task I am so familiar with and when one is relaxed it is easy to think creatively. Please don't tell my kids I find washing up relaxing. How could I capture those ideas? Writers are advised to keep notebooks all over the place and quickly jot down any ideas as they come. But my hands were in gloves so that wasn't really practical. Perhaps I could put my mobile phone on record every time I do dishes and hope I'll have lots of ideas. I don't think it is worth the bother because often I do dishes without inspiration. I think my best bet is to jot down what I can remember as soon as the dishes are done and that is what I did today. Then I got straight into writing this short article. Work when you are tired because you will not be so inhibited. I guess it's worth a try, but I don't know if it would work for me. Try a different flavour of ice cream.The idea is doing something different boosts creativity. Personally I don't care what the thinking behind the idea is, I just want an excuse to eat yummy ice cream. Move your eyes back and forth to get interaction between the two hemispheres of the brain. Make a list of annoying problems. Try to work out a solution for each one. Have more blue things around the place. Research done at the University of British Columbia found blue stimulates creativity more than other colours. 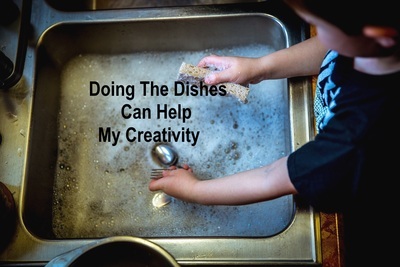 Whether it encourages a burst of creativity or not, the dishes must be done.